The Challenge Cup was the inaugural event for Major League Fishing. Filmed on Lake Amistad in the fall of 2011, the Challenge Cup brought viewers to the show in droves with its unique format. 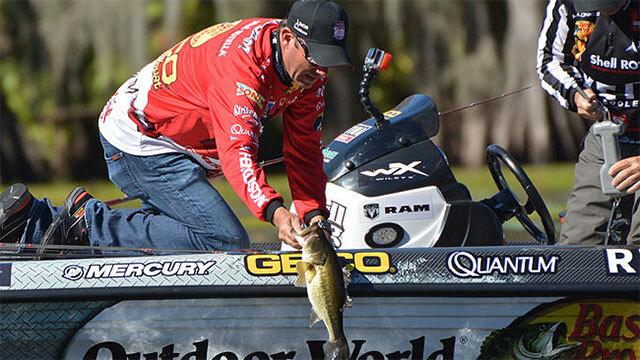 Since that day, the Challenge Cup has moved to smaller fisheries that do not typically host major fishing events. MLF’s unique format and small competition fields of up to 10 anglers, opens the door to some unique venues. The Jack Link’s Major League Fishing 2015 Shell Rotella Challenge Cup isn’t any different. As the event lands in Shreveport, La., a place that has hosted numerous Bassmaster and FLW events, including two Classics and a Forrest Wood Cup, the town obviously supports bass fishing. While the anglers have fished the Red River many times in competition, they would not be on familiar Shreveport waters this time. The first lake for the three, 10-angler Elimination days is Caddo Lake. Caddo is a shallow 25,000-acre weedy, cypress tree and stump-filled lake that straddles the border of Louisiana and Texas. Caddo features numerous boat lanes that anglers much use to navigate.